Our dedicated team will accompany you through the plans and designs of your ideas, right through the completion of your dream kitchen and bath. O’Hanlon Kitchens takes the complexities out of your project and allows you to relax. Our highly experienced designers will come to your home, take measurements and show you product samples. Against the Grain Design, LLC was formed by professional kitchen and bath designer, Scott Grubb. We have over 15 years of experience in kitchen, bathroom and whole home renovation services. High quality remodeling service with experienced craftsmanship to DMV area residents since 1999. We are committed to service and satisfaction through attention to detail and deference to the interests of our clients and their respective projects. Small 5’x8’ Bathroom Remodeling $15,000 to $50,000. Small Kitchens $15,000 to $60,000. Large Bathrooms $30,000 to $100,000. Large Kitchens $40,000 to $150,000 Finished Basements $40k to $200k, Full House Interior Renovations $120,000 to $350,000. Full house interior & exterior Renovations $150,000 to $500,000. Home additions $50,000 to $250,000. Estimates based on experience. Your actual costs may vary depending on the scope of your project. Regarding NOVO Kitchen and Bath’s sustainability capabilities, we maintain strategic alliances with individuals and institutions that offers unique knowledge and experience with respect to business, products and development related initiatives. Our team of professionals meets every challenge and request from our clientele to the very detail. The work outline is designed to provide a detailed description of our goals and work from beginning to end of the project. Our project managers and designers coordinate creativity and efficiency based upon the client requirements and approval. Furthermore, we strive to provide a pleasant working experience and strongly believe that a personal referral is worth a thousand words. Contact us for a consultation about your project. We are a woman owned design/renovation company. Charleene Doverspike has spent the past 26 years fine tuning her skills and perfecting her trade as a designer and contractor. We are a family-owned business and it shows. The owner of the business takes pride in every project and is always onsite working with his crew right down to the last detail. For over 14 years since 2004, our business has focused on Kitchen & Bath Remodeling, along with decks and general enhancement of any room in the house. We offer services from start to finish for projects. Design thru painting. I have a millwork and cabinetmaker background and my wife is an interior designer. 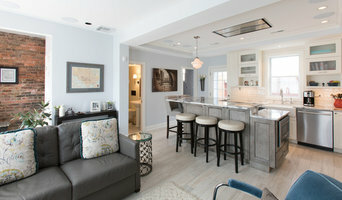 Her firm, Ann Spooner Interior Design, has helped many residential clients achieve their dreams. Taylor Made Custom Contracting, Inc. is an award-winning remodeling company servicing the Baltimore Metro area. Since 1990, we've specialized in additions, kitchens, bathrooms, basements, and more! We specialize in room additions and remodeling. We can enlarge your home to suite your changing needs. We can also update existing rooms to current styles. Home is where we make memories, share our lives and relax, it should be a perfect reflection of you and your style at Blackstone Kitchen & Bath. We believe in creating distinctive interior design solutions, finished with quality cabinetry, tile, hard surfaces and the perfect furnishings. What is in store for you is a great design experience for you and your family. Do you want a kitchen or bathroom that stands out from the rest? Looking for something unique and distinctive, upmarket and stylish? Look no further than Blackstone Kitchen & Bath to provide you with a professional service, quality kitchen & bath products. We provide kitchen remodeling and bath remodeling services for Montgomery, Howard & Carroll Counties. Visit our Kitchen & Bath Design Studio In Glenwood and meet our Kitchen & Bath Designers. Blackstone Kitchen & Bath Founder has won numerous awards for Kitchen & Bath designs over the years. Let's talk about renewing, remodeling and renovating your residential kitchen this year at Blackstone Kitchen & Bath Remodeling Firm. We partner with the finest professionals in the industry and we are your leading source for interior design and remodeling. Transitional, Traditional, Contemporary and European Styles we can achieve that distinctive style for you and your home. Contact us today and be part of our growing family of happy customers. 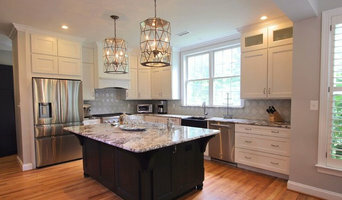 Founded by Parker Mitchell, III - RP Woodcraft LLC specializes in high-quality kitchen, bathroom and home remodels, emphasizing in custom cabinetry, home bars, built-ins, furniture, bookcases, wood countertops, storage, and more. We make the entire process simple and coordinate every detail of your full renovation. Located out of Aberdeen, MD we love working with homeowners throughout the state of Maryland. Quality and customer service is our #1 priority - we believe both go hand-in-hand and will focus on giving you personalized attention and a masterful eye for detail on all aspects of your renovation project. We use only high-quality materials and finishes, and through our collaborative design process, ensure you will find a dream solution to fit your style and needs while optimizing the full value of your home. To receive a customized quote, give us a call or send us a message today. Let us know you saw us on Houzz! United Kitchen & Bath Inc.
United Kitchen & Bath Inc. is founded by seasoned Architects, Certified kitchen & Bath designers and successful Project managers, United Kitchen and Bath is a unique & authentic professional approach to your design dreams . We create beautiful, bespoke kitchens and bathroom designs that proudly feature a signature, understated aesthetic, influenced by contemporary, modern or classic architecture and design. Our talented and experienced designers would utilize our selected profound skilled cabinet makers in their quality state-of-the-art manufacturing facilities, use innovative materials, blend texture and colors to bring your dream design to a vivid beautiful reality. At United Kitchen and Bath, we are proud of our selections, and we confidently extend a warm invitation to you to get acquainted with it all at our showroom in Chantilly. 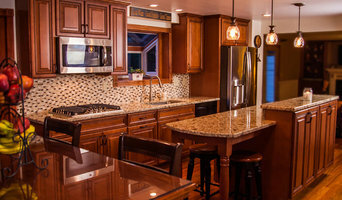 *Authorized Canyon Creek Cabinetry Dealer* Embracing the kitchen and bath design and remodeling for 20 plus years. Strong Interior Design background. Specialize in client relations and problem solving. Focus on residential projects. Love being involved from design phase through punch list. Managing projects helps keep the quality level high. Our company is based on the belief that our customers needs are of the utmost importance. Our entire team is committed to meeting those needs. As a result, a high percentage of our business is from repeat customers and referrals. D2 Contractors,LLC, is a family owned and operated home improvement business, located in Reisterstown, Maryland. D2 Contractors differs from other home improvement companies in the exclusive design-and-build services we offer our customers.When you choose D2 Contractors to help you improve your home, you are choosing a family of professionals. We treat your home like it was our own, and we enjoy what we do. This kind of care can only be expected from family. We would welcome the opportunity to earn your trust and deliver you the best service in the industry.